In addition to the Black Sea German database, the following links will help you research your German ancestors in the Crimea area. There have been many articles written about the Germans from Russia in Crimea. Some of these articles were written in the German language in the Heimutbuch der Deutschen aus Russland and in the English language in the Germans from Russia Heritage Society Heritage Review. These books/publications may be available at your local library or available from Amazon.com, Germans from Russia Heritage Collection, the American Historical Society of Germans from Russia, or the Germans from Russia Heritage Society. The Government of Taurida (also spelled Tavrida and Taurien), was an administrative district in the Russian Empire. It included the mainland between the lower Dnieper River and the coasts of the Black Sea and the Sea of Azov (63,538 km) and the Crimean peninsula (26,000 km). The center of the administrative district was the city of Simferopol. Taurida was dissolved during the Russian Revolution in 1917-1918, when oblasts replaced the gubernias. Its territory was divided between Ukraine in the north, and Crimea in the south. In 1921, Crimea was formed into the Crimean Autonomous S.S.R. Crimea then passed to Soviet Russia (one republic within the Soviet Union) and in 1954 was tranferred to Ukraine. Formerly an oblast (province), it became a republic in the early 1990s. Ethnic Germans began settling on the mainland of Taurida in spring 1789 when a group of Mennonites from West Prussia arrived and settled an area just south of Jekatarinoslaw on the banks of the Chortitza River. Within a few years, there were 18 villages in this enclave, which eventually increased to a total of 37 Mennonite villages. Another significant area of German-Russian settlement within Taurida was the Molotschna enclave of colonies, north of present-day Melitopol, Ukraine. Karl Stumpp lists 24 original colonies of the Molotschna or Prischib district, not including the numerous Mennonite settlements on the east side of the Molotschna River. Some historians refer to the Lutheran colonies on the west side of the Molotschna River, established as early as 1805, as the Prischib district. Scattered among the Lutheran colonies on the west side of the river were also several Catholic colonies, which were established after 1809. The exception is the Catholic colony of Blumental on the east side of the Molotschna River, which was established in 1822. But it was the Mennonites who dominated the Molotschna district, forming an enclave that would eventually include 55 villages. In later years, the landless sons of these and the Chortitza villages began buying land all over Taurida and formed another 30 villages for a total of 122 Mennonite villages in Taurida. An enclave of Lutheran villages formed north of Mariupol and eventually included about 25 Lutheran villages, about 10 Catholic villages, and a scattering of Mennonite villages. The village of Grunau was the Lutheran parish head for this enclave. The Belowesch colonies new Cherigov, founded by 147 families from Hessen and Oldenwald in 1766, sent 36 families to form a daughter colony near the Grunau Lutheran villages in 1802. In 1831, the original Belowesch colonies accepted a government offer of land in the Mariupol region, which absorbed 122 families who founded five more colonies south of Grunau in 1832. In 1822, a group of Swabian Separatist colonists arrived in Taurida and formed three Separatist colonies - Neuhoffnung, Neuhoffnungstal, and Rosenfeld - near the Russian town of Berdjansk. Neu Stuttgart was formed in the same area in 1824. By 1914, all of the villages had become mostly Lutheran colonies with the exception of Neuhoffnung which remained Separatist until the end. In 1835, a group of 69 Hutterite families formed the villages of Johannesruh and Huttertal near Melitopol in southern Taurida. Soon several other Lutheran villages sprang up around this same area. Although the predominant religions of the Taurida German-Russians were Mennonite and Lutheran, by 1941 there were also approximately 35 Catholic villages scattered throughout the mainland. Ethnic Germans began settling in Crimea in 1804, coming from Württemberg, Baden, and the Palatinate as well as Switzerland and Alsace. Starting in about 1860, many landless sons of colonists from all areas of the Black Sea region began migrating to the open land in Crimea. This migration reached its peak in the 1880s, but continued until about 1914. While colonists were streaming into Crimea from the north, many colonists had already begun to emigrate from Crimea to North America and Canada. In 1941, all ethnic Germans were forced to leave Crimea and were resettled in Siberia and central Asia. In all, the mainland of Taurida contained over 325 German villages and chutors. 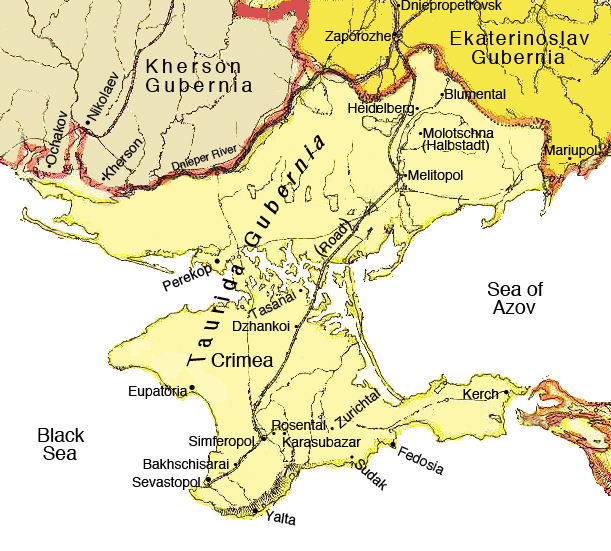 The peninsula of Crimea contained over 540 villages and chutors. Lutheran Parishes - The mainland had two known Lutheran parishes: Grunau and Prischib. There were originally only two parishes in Crimea - Neusatz and Zürichtal - which remained the only Lutheran parishes in Crimea until Hochheim became a parish in 1887, Djelal in 1893, and Byten in 1912. Lutheran Church Records - Each Lutheran church was required to send one copy of their records to the Lutheran Consistory in St. Petersburg. These records include births, marriages, and deaths. The earlier records were recorded in German and the later records in Russian. Catholic Diocese - All of the Catholic villages of South Russia belonged to the Diocese of Tiraspol. Mennonite Congregations - There were two main Mennonite enclaves on the mainland: the Choritza enclave and the Molotschna enclave. Until 1884, the Karassan Mennonite Church was the only congregation in Crimea, but by 1921 the number had increased to more than 20 Mennonite congregations throughout Crimea. Mennonite Church Records - Church records were kept at the local church. It is known that many of the mainland Mennonite Church records were held at the Odessa and Dnipropetrovsk Archives. Many of these records have been extracted from the original and extractions placed online here. It is also known that some of these records or copies of these records for Crimea were placed in the Simferopol Archives. The Busau (Ettingerbrun) church records were microfilmed by the Family History Library and extracted by Tim Janzen. They can be found online here. The Mennonites have done an excellent job of preserving their history, culture, and genealogy. This website makes no pretense at duplicating the exceptional work of the Mennonite Historical Society of Canada. Separatist Parishes - There was one Separatist parish on the mainland with Neuhoffnung as the head of the parish. There was also one Separatist parish in Crimea with Schönbrunn as the head of the parish. Separatist Church Records - It is unknown how the Separatist parish records were kept nor is it known where any of these copies might be located. However, some villagers in the Separatist villages on the mainland were Lutheran and their information is recorded in the St. Petersburg records of the Grunau parish. Also, because the Separatist colonies on the mainland became Lutheran in the latter years, their records were included in the St. Petersburg church records for the years that they were Lutheran. Finding Church Records - The available original church records for Crimea from the St. Petersburg Consistory are on microfilm at the Family History Library and are also available online. Also, check out the Black Sea German Database as some of the St. Petersburg records have been included in village family data files. Some of the early Lutheran and Catholic records are also available on microfilm from the FHL. Indexes and some extractions from these microfilms can be found online at the Odessa Digital Library. Census records (also known as revison lists) for the Mennonite enclaves for the years of 1797, 1801, 1802, 1806, 1835, and 1920 are available online here. Census records for the Hütterite colonies for the year of 1803 are also online here. Census records are available for 1816 for the villages of Friedental, Heilbrunn, Herzenberg, Kronental, Neusatz, Rosental, Simferopol, Sudak and Zürichtal in Karl Stumpp's book The Emigration from Germany to Russia in the Years 1763-1862. The census records for 1850 for the villages of Heilbrunn and Sudak are available through the Germans from Russia Heritage Society. In October and November of 1943 the German settlers in Taurida fled from Russia and were resettled in Germany. Records of these families are contained in the EWZ (Einwanderungszentralstelle or Central Immigration Control Department) records compiled by Nazi Germany. Although the majority of the Crimea Germans were forcibly resettled to areas in Siberia and central Asia in 1941, some information may be found in the EWZ records. Indexes of the EWZ records can be found in the Black Sea German Database. For more information on EWZ records check out our EWZ Q&A.